Dania Sheaib had the opportunity to use her longtime love of mathematics to real-world applications through the National Science Foundation’s Mathematical Sciences Graduate Internship Program. She studied the use of mathematical modeling in three-dimensional image microscopy. Dania Sheaib has long understood the value of mathematics in everyday life. Since high school, Sheaib has been fascinated by the ability to justify the world from a scientific point of view. When she discovered that mathematics can be used to answer physical, biological and medical questions, she knew that mathematics was the field for her. 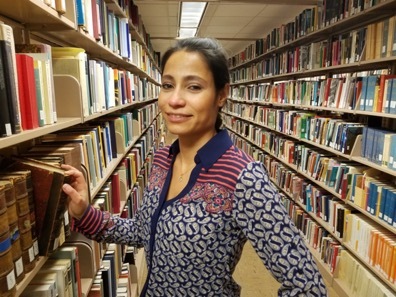 After completing her bachelor’s and master’s degrees in her home country of Lebanon, Sheaib was accepted into a doctoral program at the University of Oklahoma. Inspired by her original interest of using mathematics to solve real-world problems, Sheaib was excited to discover the National Science Foundation’s (NSF) Mathematical Sciences Graduate Internship (MSGI) Program. For her appointment, Sheaib was assigned to Argonne National Laboratory near Chicago, Illinois. Mentored by Mark Hereld, Ph.D., Sheaib focused on developing and applying mathematical methods to compute three-dimensional (3-D) representations of data. Sheaib collaborated with other researchers to assist in the development of a high-resolution, high-speed, 3-D microscope to study biological systems at the molecular and cellular level. To study such small objects, a technique called multifocal plane microscopy (MFM) is used. The two-dimensional (2-D) MFM image measures the sample in several focal planes at once. To reconstruct the 3-D structure of objects in these images, such as bacteria, an optimal mathematical model is found to account for the 2-D image content. The model attempts to distinguish between 3-D structures and background noise, but the model’s accuracy must be evaluated to ensure the quality of the technique and images produced. To assess the model’s accuracy, Sheaib and her colleagues utilized an algorithm called the two-step iterative shrinkage/thresholding (TwIST) to test how the model performs in ideal noiseless situations and in cases of significant noise interferences. Their findings revealed ways to speed up the processing of image reconstruction without compromising the accuracy of 3-D images. They also demonstrated the need to re-evaluate the mathematical model that helps distinguish background noise. All these observations are helpful for the improvement of the MFM imaging technique. Detailed, precise images of molecular and cellular systems are needed by biologists and other scientists who study bacteria and biological fluids that can cause human, animal and plant diseases. Sheaib appreciated the opportunity to conduct research and participate in activities such as seminars, workshops and student talks. She gained a new understanding of what research is possible in mathematics and what a career would be like at a national lab. Sheaib returned to the University of Oklahoma where she plans to graduate with a doctoral degree in 2018.